Cheesecake ice cream, peanut butter ice cream, or coconut ice cream…any of those flavors covered in chocolate. 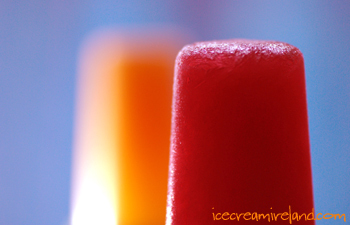 Fruit sorbet such as strawberry, orange, or pomegranate with a creamy vanilla core. Those would all make really yummy popsicles. I can’t wait to come to Ireland someday and visit your shop! Hi guy’s- How about a nice orange creamsicle (with a twist? )-you know …the old fashion kind-superb! Thanks for the feedback! TThere’s also comments coming in on our facebook page here. I’m sure whatever you do will be lovely. I personally love the oldie styles like super splits and choc ices! Hmm. I can’t see the kids choosing a lolly over a scoop. Though, some people don’t like ice cream…! Might be a nice alternative to have fruity pops. For the lactose intolerant too.